Banned Books Week has been shining a light on censorship since it was founded in 1982, and the fight for free expression is as urgent as ever. In recent years, the attacks on the right to read have become bolder, as legislatures have introduced bills that would eliminate crucial safeguards for the right to read books that some people find offensive. In recognition of National Library Week (April 7 – 13, 2019), the American Library Association’s Office for Intellectual Freedom released their list of the Top 11 Most Challenged Books of 2018. In 2018, ALA tracked nearly 350 challenges to library, school, and university materials and services, as well as 483 books that were challenged or banned. ALA normally lists 10 challenged books, but for this year’s list, the last two books were tied and both were publicly burned because they contained LGBTQIA+ content. In fact, six of the books on the list were attacked for this reason, including Alex Gino’s George, A Day in the Life of Marlon Bundo by Jill Twiss and EG Keller, Captain Underpants by Dav Pilkey, Drama by Raina Telgemeier, This Day in June by Gayle E. Pitman and Kristyna Litten, and Two Boys Kissing by David Levithan. 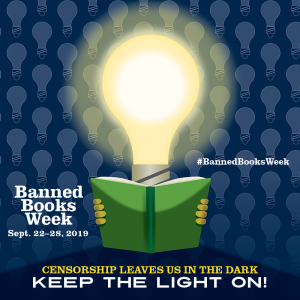 Help the Banned Books Week Coalition keep the light on during Banned Books Week, September 22 – 28, 2019! Visit bannedbooksweek.org or follow us on Twitter to get the latest Banned Books Week and censorship news. The Banned Books Week Coalition includes American Booksellers Association; American Library Association; American Society of Journalists and Authors; Association of University Presses; Authors Guild; Comic Book Legal Defense Fund; Dramatists Legal Defense Fund; Foundation for Individual Rights in Education (FIRE); Freedom to Read Foundation; Index on Censorship; National Coalition Against Censorship; National Council of Teachers of English; PEN America; People For the American Way Foundation; and Project Censored. It is endorsed by the Center for the Book in the Library of Congress. Banned Books Week also receives generous support from DKT Liberty Project and Penguin Random House.